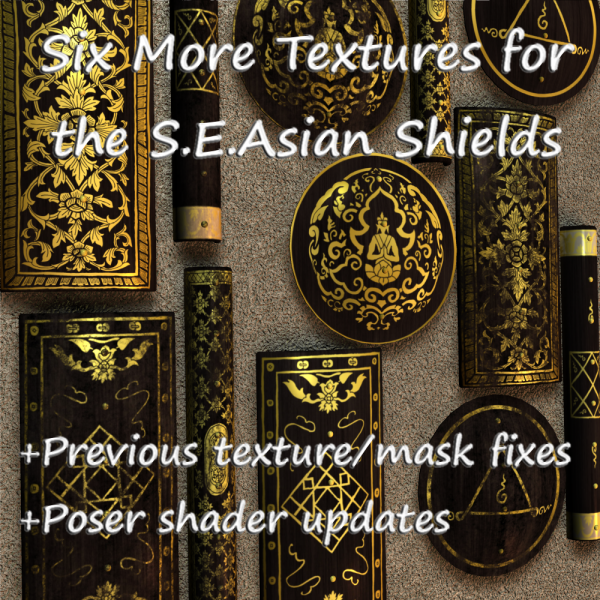 This is an add-on texture set for my South East Asian Shields freebie - two new designs for each of the three shields, with 'new' and 'worn' versions. You'll need to download the shields separately if you don't already have them - they're available in the Renderosity Freestuff and at ShareCG. I've also included a couple of fixed/updated versions of some previous masks, textures and shaders. - Masks for rectangular/narrow designs 1 and 2 and round design 1 now include the studs. - New and worn textures for rectangular/narrow design 2 now include the studs. - Version 2 of he Poser DMS(Basic), TMS(Basic) and ShieldTMS(Basic) shaders now include separate control for the specular channel. (N.B. No change to the equivalent DAZ Studio shaders). Teri/Ometetl: you're welcome - I like it when folks like the stuff I do! Elowan (6 years ago) Inappropriate? Getting better and better. Thanks!